Men's Kilts now come with a Small Attachable Pocket, which attaches to the Bandoleer. For crisp pleats remove from dryer while slightly damp. Fold in half, fold in half again, smooth pleats with your hand and clip hang. !ATTENTION! Your pants have been lying to you. Pants sizing is not in actual inches, your waist is typically 3 to 4 inches larger. Sorry to break it to you. There is a reason they call it "Vanity Sizing". So, be sure to measure for proper fit. 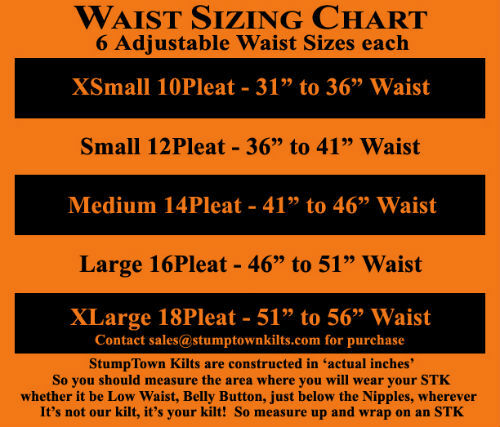 21" Kilt - Pants Inseam 30" to 32"
23" Kilt - Pants Inseam 33" to 34"
Each Kilt comes with 6 inches of adjustability using our trademarked snap system. This allows you the Kilt wearer to adjust the Kilt to accommodate for weight fluctuation. 7-7.5 Ounce - 65/35 Poly Cotton Twill Blend. Gets softer as you wash it. 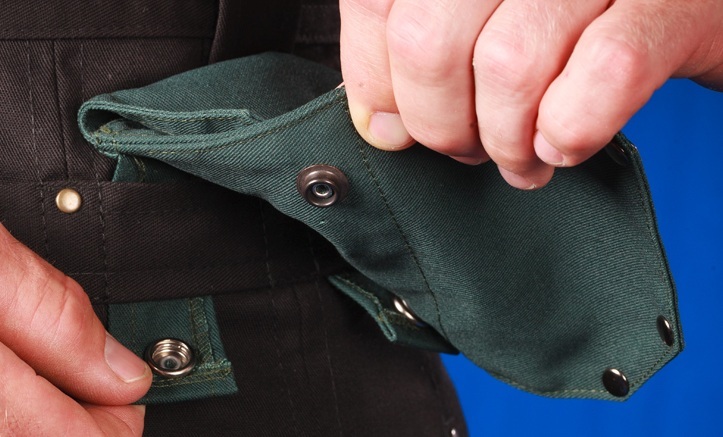 Attachable Pockets are more stylized than your typical sewn on floppy cargo kilt pockets, providing plenty of storage for your personal items. Highly functional and durable for rugged abuse on the trail or for everyday wear. 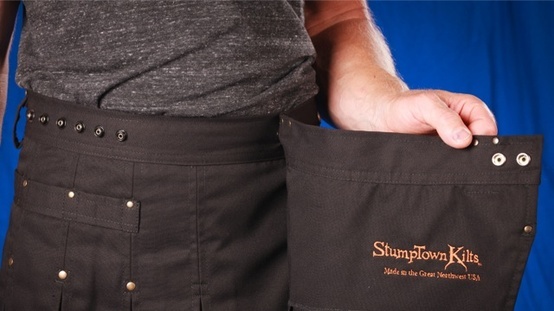 StumpTown Kilts is the first modern Kilt to offer an attachable pocket strap (bandoleer) positioned along the waistline of the Kilt giving you the option to wear your Kilt with or without pockets. Simply add pockets for more utility and extra storage or without pockets for a sleek dressy look. It’s your Kilt. Customize it the way that best fits your activities or personal style. The bandoleer also provides great attachment points for clips, D-rings, carabiners and alike and is reinforced with bar tacking and rivets for added strength. 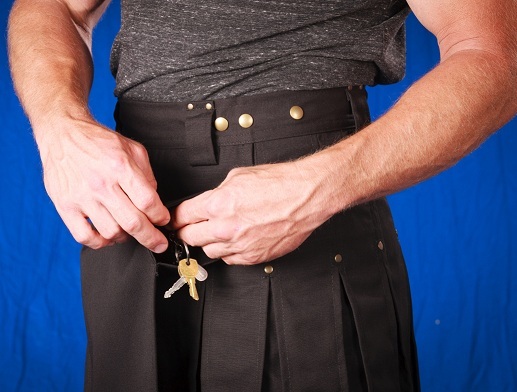 Each Kilt comes with one Small Attachable Pocket. Extra Attachable Pockets sold separately. Deep internal secret pocket located in the front apron of the Kilt. Providing plenty of storage and secrecy... if needed. Our Kilts are designed for the person on the go. Made of a 65/35 poly cotton preshrunk twill. Normal wash and dry. NO IRONING REQUIRED. Oh Ya! The color holds it's consistency (except the Camo which is made-to-fade) and the fabric gets softer as you wash it - no shrinkage. Durability and comfort. Custom pleat design to prevent puffiness or curling of the pleats. StumpTown Kilts utilize box pleats sewn on the inside and outside of the Kilt further preventing curling.